Bill Nelson is unusually popular with Republicans and independents and would start out in a good position for reelection- unless Jeb Bush made a surprise decision to run against him. Nelson's approval numbers don't appear on the surface to be that good, with 36% of voters approving of him and 33% disapproving with a pretty remarkable 31% holding no opinion even after nearly 16 years in statewide office. There are some unusual quirks in his numbers though that amount to him actually being stronger than his topline numbers might suggest. Democrats are pretty tepid toward him, with only 45% approving to 19% who disapprove. Usually we see folks closer to the 70% approval mark within their own parties. But he has an unusual level of popularity with Republicans- 23% might not sound like a lot of crossover support but many Democrats this year are finding themselves with single digit approval with Republicans. And Nelson's on positive ground with independents as well at 42/36, again somewhat unusual in a year where those voters were not particularly friendly to Democrats. As a result Nelson leads by 8-16 points in hypothetical match ups against Republicans who have shown the most interest in making the race so far. It's 44-36 over Connie Mack IV, 47-36 over George LeMieux, 44-32 over Mike Haridopolos, and 46-30 over Adam Hasner. There are two main reasons for Nelson's leads. The first is that the Republicans are largely unknown and not particularly well liked by the voters who do have an opinion about them. 78% of voters in the state are ambivalent toward Hasner and it's 70% for Haridopolos, 58% for LeMieux, and 56% for Mack. All four of them have net negative approval/favorability ratings. One of these folks could certainly emerge as an 'A' list candidate, much as Marco Rubio did, if they got the nomination and became better known but for now this is a decidedly 'B' list of candidates. The other reason for Nelson's initial advantage is that not only do unusual numbers of Republicans and independents like him, they're also willing to vote for him. He leads Haridopolos and Mack by 27 points with independents and has a 28 point advantage over Hasner and LeMieux with them. He also gets anywhere from 15-22% of the GOP vote against each of them. Nelson's going to start out as a decently strong favorite if any of those folks are the GOP nominee but it would be a different story if Jeb Bush got into the race. 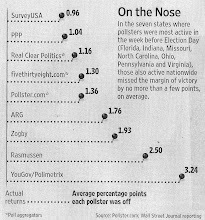 Bush continues to be well liked in the state, sporting a 51/40 favorability. Bush is universally popular with the Republican base, is unusually popular with Democrats at a 29% favorability, and is on positive ground with independents as well. In a hypothetical contest with Nelson he leads 49-44, taking a pretty substantial 23% of the Democratic vote and holding Nelson to a four point advantage with independents in contrast to the wide margins he has over the other contenders. Nelson's in decent shape but certainly not invincible and the competitiveness of this race will hinge a good deal on how strong the Republican candidate field ends up being. That's all. She will shake things up for Mouth-full-of yellow-teeth-Nelson. PPP offers the highest quality polling at the most affordable price of any company out there. Contact Tom Jensen at tomj@publicpolicypolling.com or 919-744-6312 to discuss your project.